Home | People | SafePaw ice dam melter snow melt "Green Award Winner" 100 percent safe Ready to Ship. | Safe Paw ice snow melt melter works like no other Order (60) by the pallet 100 percent safe in Stock..Ready to Ship. (Estimated shipping cost upon order). Home | Dogs | SafePaw ice dam melter snow melt "Green Award Winner" 100 percent safe Ready to Ship. | Safe Paw ice snow melt melter works like no other Order (60) by the pallet 100 percent safe in Stock..Ready to Ship. (Estimated shipping cost upon order). Home | Horses | SafePaw ice dam melter snow melt "Green Award Winner" 100 percent safe Ready to Ship. | Safe Paw ice snow melt melter works like no other Order (60) by the pallet 100 percent safe in Stock..Ready to Ship. (Estimated shipping cost upon order). Home | Cats | SafePaw ice dam melter snow melt "Green Award Winner" 100 percent safe Ready to Ship. | Safe Paw ice snow melt melter works like no other Order (60) by the pallet 100 percent safe in Stock..Ready to Ship. (Estimated shipping cost upon order). Home | SafePaw ice dam melter snow melt "Green Award Winner" 100 percent safe Ready to Ship. | Safe Paw ice snow melt melter works like no other Order (60) by the pallet 100 percent safe in Stock..Ready to Ship. (Estimated shipping cost upon order). Safe Paw ice snow melt melter works like no other Order (60) by the pallet 100 percent safe in Stock..Ready to Ship. (Estimated shipping cost upon order). Price is just for product and does not include freight charges FOB to be added to the order....shipping weight is 2150 LBS per Pallet of 60 each of 35 lbs pails per pallet. We will email you the estimated shipping cost upon your order. 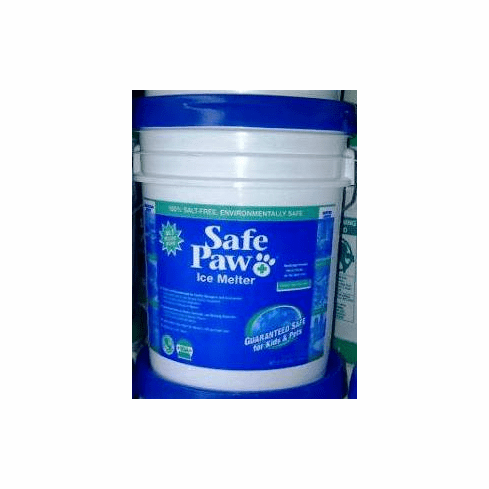 Pet chains and many other retailers are telling Safe Paw customers that the ice melter they carry is the same formulation as Safe Paw. This is absolutely false. Safe Paw is protected by patents and propriety components. Dont be fooled by the claims of others, and be confident by only using Safe Paw to protect the pets you love. Q: What is Safe Paw™? A: No other ice/snow melter works like Safe Paw and is 100 percent safe for children, pets, all surfaces and the environment. It is unique in its compound and benefits without utilizing any salt as an ingredient and gives off no heat to melt ice. Safe Paw is a patented dual-effect compound, made up of crystalline amide core infused with special glycols. This non-corrosive composition gives Safe Paw a two-way timed-release action. The liquid component starts melting ice instantly while breaking its surface tension. This allows the crystal-core to quickly penetrate and destabilize the ice and speed up the melting process. Safe Paw actually attracts heat to make it even more effective but does not give off heat. This "endothermic" reaction takes advantage of solar effect and provides extra melting power during daylight hours. As an added feature, Safe Paw leaves an invisible protective shield that prevents ice from sticking to the surface for up to three days. This makes shoveling easier and saves work. Q: How does Safe Paw differ from other ice melter products? A: Safe Paw contains no salt. Its patented dual-effect compound, made up of crystalline amide core infused with special glycols, provides a non-corrosive composition with two-way timed-release action. The liquid component starts melting ice instantly while breaking its surface tension and works up to two degrees below zero. This allows the crystal-core to quickly penetrate and destabilize the ice and speed up the melting process. Rock salt and other salt-based ice melters contain sodium chloride or potassium chloride that melt only down to 24 degrees which is not very low and does it very slowly. Often these white pellets (crystals) sit on ice and snow surfaces for a long period before penetrating. Exposure or digesting these ingredients can cause health problems for pets and children. Moreover, the salt residue left over from these products causes damage to pavers, concrete, asphalt, wood, lawns, floors and rugs. With the exception of Safe Paw, all ice melters on the market contain salt, including Road Runner, Driveway Heat, Zero Ice, Arctic, Halite, Qik Joe, Ice Vice, Safe Step and Peladow. Q: What makes rock salt and ice melters containing salt dangerous to pets and children? A: Exposure to salt and salt-based ice melting products, a common occurrence, can cause dogs severe dermatitis, inflammation of the paws and serious gastrointestinal problems including vomiting and internal burns of the mouth and digestive tract. Salt can also burn and irritate children's eyes and skin and cause internal problems if swallowed according to pediatricians. For dogs, in particular, exposure to salt and salt-based ice melt products can mean an unhealthy winter and unplanned trips to the vets' office or animal hospital. The problem is that when dogs are let out they frolic and eat the snow and many of the ice melt products sit on the surface of the ice. Dogs either ingest these ice melt pellets or they get frozen into their paws. Later when they are inside with higher temperatures the ice melts and dogs begin to lick their paws. The salt can heat up as high as 175 degrees and not only burn their skin but their mouth and digestive system. Q: Do most consumers know the health dangers of rock salt and ice melters containing salt? A: No. If fact, a national survey of more than 500 consumers living in cold weather states showed that an alarming nearly two-thirds of the respondents (62% total; 66% of men) were not aware that salt and salt-based ice melting products pose a health danger to pets and children who digest or come into contact with these products. The survey also revealed that 60% of the respondents said they use rock salt or salt-based ice melters in their households. Q: While Safe Paw is safe for pets and children, how does it work in melting snow and ice compared to rock salt and products containing salt? A: Safe Paw works just as good or even better than salt or salt-based products. In fact, Safe Paw begins working immediately to penetrate ice while other ice melters work very slowly. Moreover, most salt-based products melt ice only down to 24 degrees, while Safe Paw works up to 2 degrees below zero. Safe Paw also leaves an invisible protective shield that prevents ice from sticking to the surface for up to three days. This makes shoveling easier and saves work. Q: Are there any other advantages of using Safe Paw? A: Yes. Salt is a corrosive compound and its residue can damage the environment such as lawns, plants and even contaminate well water and water supplies. Salt can also severely damage and permanently discolor brick pavers, stones, asphalt, concrete and wood decking. When tracked inside, it can also damage rugs, carpets and wood floors. Children, pets, surfaces and the environment can be adversely affected by the use of rock salt and salt-based ice melter products used by households in the winter. A recent national survey shows that 60 percent of American households use these products in the winter. And, an alarming 62 percent are unaware of the health dangers associated with the use of these products. Safe Paw is the only 100 percent salt-free ice melter on the market and is 100 percent safe for children, pets, surfaces and the environment. It is the smart and safe product to use with winter, and Safe Paws pellets are green to make it easy for consumers to know the difference. What Rock salt and other salt-based ice melters contain sodium chloride or potassium chloride which can heat up to 175 degrees when exposed to water, ice and low temperatures. Often these white pellets (crystals) sit on ice and snow surfaces for a long period before penetrating into the ice. Exposure or digesting these salt compounds can cause health problems for pets and children. Moreover, the salt and salt residue left over from these products cause permanent damage to pavers, asphalt, concrete, wood decks, floors and rugs and can harm the environment, including burn and kill lawns and plants and contaminate well and drinking water supplies. How For dogs, in particular, exposure to salt and salt-based ice melt products can mean an unhealthy winter and unplanned trips to the vets' office or animal hospital. The problem is that when dogs are let out they frolic and eat the snow and many of the ice melt products sit on the surface of the ice. Dogs either ingest these ice melt pellets or they get frozen into their paws. Later when they are inside with higher temperatures the ice melts and dogs begin to lick their paws. The salt can heat up as high as 175 degrees and not only burn their skin but their mouth and digestive system. Children also can come into contact with salt and salt-based pellets while playing. Occasionally they will ingest the pellets or more likely get them on their hands and rub their eyes causing irritation. Why Safe Paw was developed by a chemist engineer to eliminate the health and environmental problems associated with melting ice and snow. Safe Paw contains no salt. Its patented dual-effect compound, made up of crystalline amide core infused with special glycols, provides a non-corrosive composition with two-way timed-release action. The liquid component starts melting ice instantly while breaking its surface tension and works up to two degrees below zero. This allows the crystal-core to quickly penetrate and destabilize the ice and speed up the melting process. Thats why you wont find these warnings on Safe Paw that are found on all salt ice melters: Danger! Keep away from pets and children. Wear rubber gloves and goggles when using. Wash contaminated clothing and call doctor immediately is contact with eye or ingested. Safe Paw is the No. 1 selling no-salt snow and ice melter that is safe for the environment and is children and pet friendly. What's more, the popular Safe Paw ice melter from Gaia Enterprises, Inc. is packaged by adults with developmental disabilities in York, Penn. Patented Safe Paw is the only guaranteed 100 percent salt-free ice melter on the market,and was developed by a chemical engineer to eliminate the health and environmental problems associated with melting ice and snow. Safe Paw is 100 percent salt-free. Its patented dual-effect compound, made up of crystalline amide core infused with special glycols, provides a non-corrosive composition with two-way timed-release action. The liquid component starts melting ice instantly while breaking its surface tension and works up to two degrees below zero. This allows the crystal-core to quickly penetrate and destabilize the ice and speed up the melting process. Safe Paw is the only product that prevents nitrates that are harmful to the environment by burning and killing lawns and plants, and contaminating well and drinking water supplies.